Riverwalk is a condo and townhome development that is broken into sub-area complexes. Each complex has its own unique characteristics from low maintenance townhomes to condos with a 55+ age restriction. The condos and townhomes in Riverwalk were built between 1985 through 2001 by several different builders. The floor plans of homes in Riverwalk are diverse ranging from smaller 800 square foot condo units to 2,000 square feet townhomes with basements and 2 car attached garages. One of the reasons the Riverwalk complex is sought after is because the Riverwalk Master Association managed by KC & Associates provides ample amenities for residents including a clubhouse, community pool, fitness facility, grounds maintenance, snow removal, sewer, water and trash pickup. The condos and townhomes in Riverwalk are located on the Littleton Golf & Tennis Club and within walking distance to the Platte River trail in Littleton Colorado. Our Riverwalk real estate agent can schedule a tour of condos and townhomes in the area by calling 303-325-5690. There are 24 units in the Adults 55+ condos complex that include 1,000 to 1,200 finished square feet. The complex was built in 1985 but a new roof was installed in 2015 and a new elevator in 2016. This beautiful secure red brick building also has underground parking and a large storage cage for residents. The Arlington Condos are the most affordable sub-area of Riverwalk with 48 units built in 1998 that are housed in a secure building with elevator and underground parking garage. The floor plans of the units vary from 800 to 1,100 square feet. In addition, to the other HOA amenities, this complex also provides residents with a sauna, steam room, pool, meeting rooms, and game room. These side-by-side townhomes include 2 floors of living space with 1300-1400 square feet. Each unit comes with an attached tandem garage. The Belmont townhomes were built in 2001, include 68 units, and are located at the back of the Riverwalk subdivision. Canterbury is the largest sub-area with 134 townhomes that range from 1300-1400 finished square feet. They were built in 2001 and include 2-3 bedrooms and an attached 2-car tandem garage. These units are located on the inside loop of the Riverwalk subdivision. The Centennial complex is a secured building with reserved garage parking space and storage unit with easy elevator access for adults 55+. There are 100 units in the complex with 800 to 1,300 square feet that are all handicap accessible. The complex was built in 1998. Fairway Six provides ranch-style townhomes that are attached on one side. Floor plans range from 1,700 to 3,300 square feet which includes a basement. The townhomes were built in 1997, include a 2 car attached garage for additional storage, and a small 2,600 square foot yard which is maintained by the HOA. An attached patio home sub-area with 52 homes built between 1997 through 2001. These ranch style patio homes are low maintenance with lot sizes of 2600 square feet that are maintained by the HOA. Inside floor plans range from 1,100-1,400 finished square feet plus they all include additional space in the 2 car attached garage. 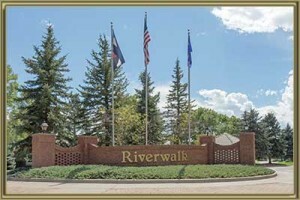 The Greens is the only gated sub-area of Riverwalk which include 77 contemporary townhomes built in 1997. The units have 2-3 bedrooms with 1,500 to 2,400 square feet including a basement and 2 car attached garage. The traditional townhomes at Riverwalk provide residents with 1800-2400 square feet of living space which includes a spacious basement. The homes also include a 2 car attached garage and most have a patio with a brick wall for privacy. The 28 units available were built in 1986. See what your home is worth With an Instant Home Valuation Online. Want advice on selling your house? We provide a free staging consultation, pre-listing prep plan, and a Riverwalk real estate market analysis. Call us at 303-325-5690 to learn more. New to the Area? Call our Riverwalk real estate agent at 303-325-5690 to schedule your tour of Homes in Littleton CO.
Click on the map pins to see each of the sub-areas for homes, condos and townhomes in the Riverwalk Subdivision. Each pin has a link to our detailed sub-area page to learn all about the neighborhood, community and see all listings for sale.